When it comes to making money, energy is still the biggest game in town. The problem is that 99.9% of the media pundits, market analysts, money managers, and investment advisors will never be able to help you win big at this game. They simply don't have access to the power-players who control 90% of the world's energy. But one of the world's most highly sought-after energy consultants, Dr. Kent Moors, does. His clients include six of the world's top 10 oil companies, 20 world governments, and high-ranking representatives from OPEC, the IEA, the EIA, and our own National Intelligence Community. It's the kind of business intelligence the vast majority of Wall Street analysts will never have access to – let alone the mainstream press. And you won't find the kinds of opportunities Kent regularly shares with Energy Advantage readers in a magazine… or on TV. You certainly won't hear about them from your broker either. Although exceedingly profitable, Kent's recommendations are only known to a very few. I sold my position yesterday for 140% gain after broker fees…….thanks for the great gain! 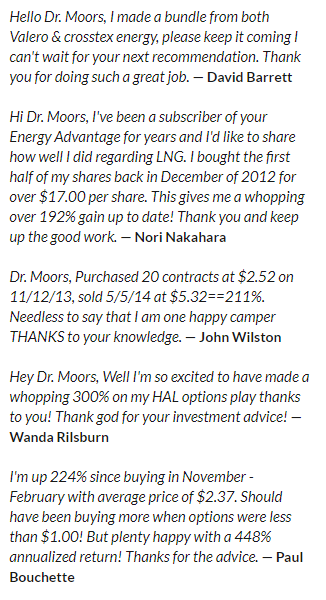 The fact is, Jeff is just one of the thousands of readers who have consistently banked big gains since joining Energy Advantage. We hear from them all the time. Armed with Kent's access into the world's biggest power players, you could win any time, in any energy market, and under any market conditions. And it's never been easier to become a member. There's an energy story no one's telling you. And it's huge. It's about the overwhelming demand curve in energy that's going through the roof. The need is so enormous it's going to take at least $48 trillion in new energy investments between now and 2035 to keep the world humming. That's over $2 trillion in new energy spending every year for the next 20 years… or the world will come to a virtual standstill. The off-shoot for investors is almost inconceivable profits. It's being driven by the greatest growth story the world has ever known. Countless billions in Asia who are suddenly wealthier, healthier, and upwardly mobile. To put this massive “super shift” into perspective, all you need to do is look at the map below and remember that more people live in the RED REGIONS than in all of the GRAY COMBINED. 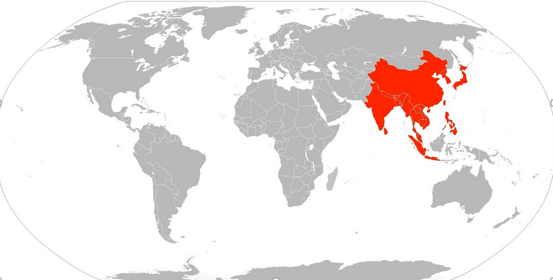 For every 10 people in the world, six are from Asia. And all of them want to live more like their Western counterparts. In fact, the size of the “global middle class” will increase from an estimated 2.3 billion this year to 3.2 billion by 2020, and to nearly 5 billion by 2030, with the bulk of the growth occurring in Asia. 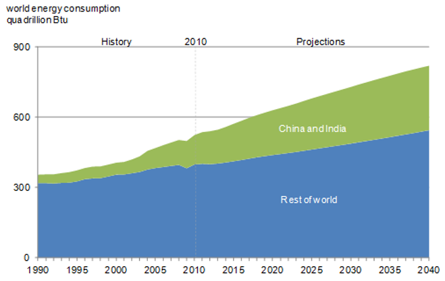 Even with all of the efforts to conserve energy, the U.S. Energy Information Administration (EIA) now projects global energy demand will rise more than 40% by 2035. To meet this squeeze, the world is going to have to produce a record-setting amount of energy every year for as far as the eye can see. To do it, the world is going to need every viable source of power available. Oil, coal, natural gas, wind, solar, biofuels, geothermal, nuclear power – you name it and it will be needed… all in volumes too big to contemplate. The fast-rising demand curve is going to double or even triple the number of opportunities to make a fortune in the energy sector over the next several years. And for as long as I have been in this business, I couldn't possibly be more optimistic than I am right now. The investment opportunities I'm investigating have never been this good. And that's just a small taste of what I'm investigating at the moment. Each represents an unbelievable opportunity… if you know how way to play it. Of course, the kinds of recommendations I regularly share with members of Energy Advantage are only known to a select few. It's inside access, and you won't be able to get this type of information anywhere else on earth. Any one of the opportunities I disclose could make you enough money to retire early. The Monthly Issue – On the third Friday of each month, I will share my findings with you over a secure network. Inside each of my issues, you will get detailed descriptions of opportunities most people know nothing about, key developments in the energy industry, and updates to existing recommendations. Industry Briefings – Over the past year, I've been to over 20 countries. Often times, these trips expose me to the kinds of deals that can change your life. As a member of Energy Advantage, I'll give you news on every trip and the folks I talk to. Vital Updates – The minute I learn of any news that can affect your position in any opportunities, you will immediately be notified via email. Private 24/7 Access – Once you become a member of Energy Advantage I will give you private login information to my secure website. Here, you can view and read all of my monthly briefings and updates 24 hours a day, 7 days a week. No, it's not insider trading – but it's valuable enough to feel that way. To begin your risk-free membership today, just click the button below. 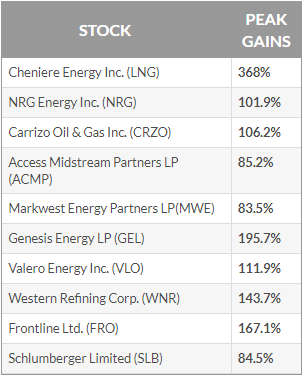 Since its launch, Energy Advantage has rewarded members with 90 winners (or currently open positions) that have offered double- and triple-digit gains. 12 issues of Energy Advantage with detailed descriptions of opportunities most people know nothing about. Weekly Intelligence Feeds featuring full access to my global network of insiders. And I back it all up with the best guarantee in the business. If, after 90 days, you decide that Energy Advantage is not for you, for whatever reason, let me know and I’ll refund your money. That way, you risk nothing. If you don’t – at the very least – see the opportunity to DOUBLE your money FOUR times over the next 12 months, just give us a call, and we’ll give you a 100% refund. No questions asked. I make this promise because I believe I can help you … in a way NO ONE else can. Go here for immediate access to the Energy Advantage portfolio. Go here for immediate access to Energy Advantage updates. Go here for immediate access to previous issues of Energy Advantage. Go here for immediate access to Energy Advantage research reports.